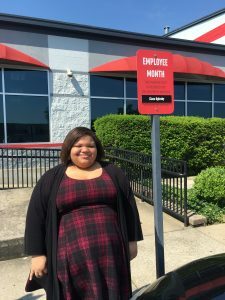 Congratulations to our May 2017 Employee of the Month, Ciara Oglesby! Ciarawears the title of Sales Coordinator at Big Visual Group, assisting our entire sales team and handling order entry tasks. Ciara considers herself a lifetime learner, always pushing herself to gain more knowledge in the industry and from fellow coworkers. She truly enjoys her role, and especially the environment and culture of the sales department. Ciara’s role is vital when it comes to investigating previous client orders and being able to duplicate or refer back to them for the clients’ current or future signage needs. Ciara’s past work experience in ASD, shipping, and clerical work has positioned her for success in her current role, especially when it comes to tasks involving proofing or alleviating the workload stress from sales team members. What’s Ciara’s favorite thing about working at Big Visual Group? She says, “The friendships. That has always been my answer. I have a good bond with most everyone here!” Since this is Ciara’s fourth time receiving the Employee of the Month honor, it’s truly evident that she is highly appreciated and valued by her coworkers who chose her as the recipient. Beyond the office, Ciara has a passion for drawing, which is another wonderful reason for her to be working in such a creative environment as Big Visual Group. As for hobbies, Ciara loves to binge watch shows on Netflix and is currently alternating between Grey’s Anatomy and Private Practice. An interesting fact about Ciara—she doesn’t like pizza—likely putting her in a category all by herself, right? With Ciara’s strong work ethic and kind demeanor, there’s no doubt that she is truly deserving of this honor. She’s grateful for the opportunity to serve at Big Visual Group and especially with such an amazing team!